of this research into a group process. role of the guest in particular, each of them leaving a trace of their personality within the piece. 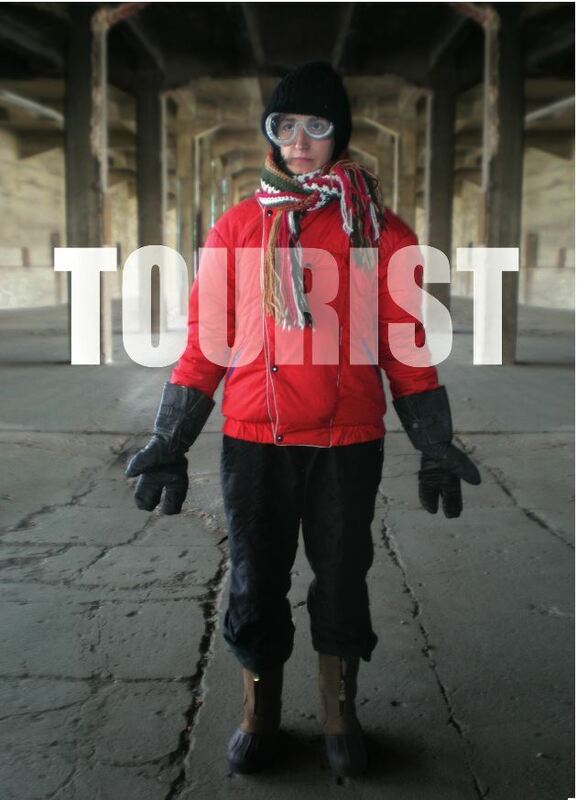 "TOURIST" premiered at Uferstudios Berlin in September 2010 as part of "Perfect Wedding"
Nottdance Festival 2011/ Cultural Exchanges DMU Leicester. Gabriele Reuter (director & performer) is a dance artist based in Berlin and Nottingham. She studied contemporary dance and Arts Management in the UK before creating her own works in collaboration with other dancers, photographers and musicians since 2001. As part of the Tanzplan Deutschland artist-in-residence scheme at fabrik Potsdam in Germany developed the interactive dance piece Relay with choreographer Donatella Cabras and media artist Barret Hodgson. Her first solo Inventory/(Räumung) premiered 2008 at the nottdance festival in Nottingham and was shown internationally. In 2009 Gabriele was part of the Europe in Motion choreographer’s exchange at Springdance Festival Utrecht. Jane Leaney (performer) trained at London Contemporary Dance School and has worked in the field of Theatre and Dance for several years. She has worked for more traditional companies as The National Theatre and The Royal Shakespeare Company, diverting to Site Specific and Interactive Theatre from companies like Punchdrunk and The Clod Ensemble. Whilst working at The National Theatre Jane was trained by Handspring Puppet Company and went onto perform in the West- End hit ‘Warhorse’. Jane met Gabriele while dancing for Choreographer Rick Nodine and both are part of a collective ‘Neat Timothy’ (Improvisation in Performance). Jane also leads workshops and classes and is currently teaching Performance Studies at London Contemporary Dance School. Julieta Figueroa (performer) - Born in Santiago de Chile. Between 1994 and 1998 she studied Drama at Universidad de Chile, in Santiago de Chile, where she participated in several theatre, TV and film productions and as a dancer for the Elisabeth Rodriguez Dance Company. Since 2002 she lives in Berlin and has worked since then as training assistant for several of Alexander Stillmark´s national and international theatre projects. In March 2009 she finished her Choreography studies at Ernst Busch Hochschule Berlin and works as a choreographer for Theatre and Opera, as well as a dancer in Berlin and London and in Santiago de Chile as an actress in short and long feature films. She is also developing her own works in Berlin. Judith Adam (costume designer) was born in Northern Germany. Wassan Ali (lighting designer) was born 1977 in New York. She studied Theatre and Event technology at the Dramatic Institute in Stockholm, and worked at a number of theatres in Stockholm. Since 2003 Wassan is based in Berlin, and is freelancing as a light designer and technician for contemporary dance. In 2008 she did film lights for the documentary "Working on it" by Karin Michalski. Wassan filmed for the exhibition "To this end, it is not enough" by Malin Arnell in 2009 and has worked as a camera assistant. Recent work: lights for Martin Nachbar "Urheben/Aufheben", Ciupke/Cash "from the other side..." and Gabriele Reuters "Solo". In the fall 2010 she is working with the new project of Gabriele Reuter, as well as with Martin Nachbar.